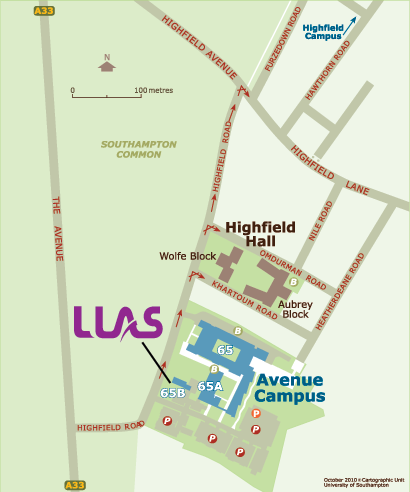 LLAS is based in the Archaeology Building (65a), room 3011, on the third floor. From the M3, use junction 14, follow signs for Southampton A33 (not Southampton Docks). Follow the A33 (Bassett Avenue) through two roundabouts to a major intersection (with the University's Medical and Biological Sciences building to your left). Carry straight on (The Avenue) through another set of traffic lights, then take the first left onto Highfield Road. Avenue Campus is on your right. From the M27, use junction 5 (Southampton Airport/Eastleigh). If coming from the east, take the 1st exit off the roundabout. If coming from the west, the 4th exit. Follow the A335 dual carriageway through two sets of traffic lights. At the 3rd set, the road divides. Turn right onto Burgess Road (McDonald's will be on your left). Continue to the end of the road, past the University’s Highfield Campus, the banks and the Shell garage, until you reach a major intersection. Turn left (The Avenue) through another set of traffic lights, then take the first left onto Highfield Road. Avenue campus is on your right. The University’s own bus service, uni-link, provides services interconnecting University campuses with links to rail, air and ferry services. Please see the uni-link pages for full details. Alternatively, the public bus service is provided by First Hampshire. Please see the First Hampshire website for full details. Locked storage facilities for cycle users are available for visitors to Avenue Campus. Southampton Airport provides a range of domestic and continental services. The airport is just a 15 minute taxi ride from the University. Fast services from London and Bournemouth/Weymouth serve Southampton Central and Southampton Airport. Check here for train timetables. Both stations are served by the uni-link bus service. At Southampton Central, use the south side (platform 4) exit for the U2 bus service. At Southampton Airport, exit on the airport side of the station where you can connect with the U1 bus service. This will take you to Highfield Campus interchange. To get to the Avenue Campus change at the interchange for the U2 bus service. 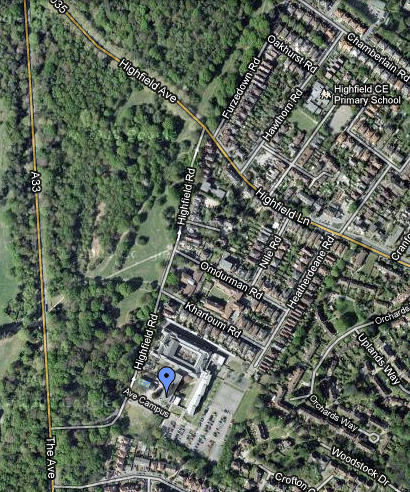 Local services and slow trains from London and Bournemouth/Weymouth also stop at Swaythling Station which is a 30 minute walk from Avenue Campus.